Tune into ESPN during the football season and you’ll hear things like…. The answer to all of these questions is: “The Dallas Cowboys”. 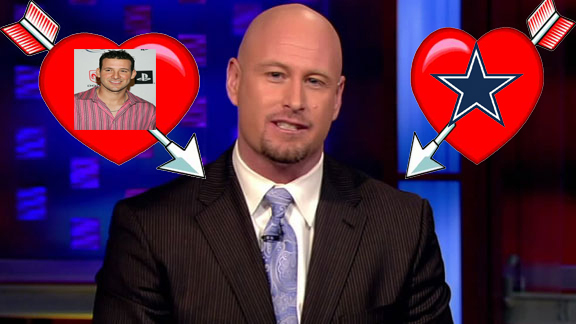 I think Trent Dilfer is one of ESPN’s better football analysts and don’t mind him when he’s on the air….Unless it’s time to talk about the Cowboys. I don’t know if he’s trying to get into Jerry Jones will or what but his bias is pretty obvious. It was the same way last year leading up to the playoff game between Dallas and Minnesota, a game that ultimately had Minnesota crushing the Cowboys. Dilfer does a great job breaking down the NFL but I think his fetish for the Cowboys sometimes blurs his take on things. I think Tony Romo has some embarrassing photos of Trent Dilfer and is threatening to release them to the public unless Dilfer showers the Cowboys with praise.